Knife sharpeners are essential to keep your valuable cutlery in prime condition. Sharpen your tools quickly and easily with a Chef's Choice, Brød & Taylor or Kuhn Rikon sharpener. Whether you choose manual or electric knife sharpener we have a model to meet your needs, including many diamond hone sharpeners. A sharp knife is both safer and more productive. Keep yours in tip-top shape with any of our advanced sharpeners: Click a model below to explore! Cutlery plays a key role in kitchen life, from chopping and dicing to slicing and carving. In fact, it’s one of the most important tools in your kitchen and household, so wouldn’t it follow that the tools it takes to keep your cutlery in perfect working condition are just as important? Dull knives steal precious time, they’re aggravating and unsafe, and they produce poor results. Let’s solve these problems and get your knives in shape! We’d all like our favorite knives to last forever, but the fact is that knives are dulled a little with every use. After a while sharpening is needed to keep them working up to their potential. A good knife sharpener creates a sharp, durable edge while removing only as much blade material as is absolutely necessary. Each of our sharpeners achieves these aims, so every knife in your arsenal can enjoy a long and productive life. Quality knives use hard, tough steel formulations designed to take a sharp edge and not wear quickly. Those characteristics make a knife sharpener’s job challenging. The traditional material for sharpening has been natural stone, and more recently, synthetic stone. Many of our sharpeners use a new material, diamond. Surfaces coated with industrial diamond particles allow these sharpeners, for the first time in history, to combine two highly desirable characteristics: Speed and cool operating temperature. Speed is good, obviously, because we don’t want to spend hours sharpening our knives. And a diamond knife sharpener can actually do in minutes what would take hours with a stone. Diamond can do this because it’s sharper than other cutting surfaces, and because its sharpness cuts with almost no friction. Friction creates heat, and excessive heat will de-temper and ruin the thin, sharp edge of a knife. On a microscopic level, diamond sharpeners have a scalpel-like action rather than the brute scraping action of traditional stone. Diamond sharpeners give you the edge you want very quickly, with no risk of ruining the blade. Edgecraft is the marketplace leader in electric knife sharpeners. 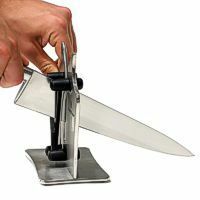 They offer a full range of sharpening stations, including choices for virtually every kind of cutlery. Safe, reliable and easy to use, their sharpeners let you sharpen even the most expensive knives with confidence. The Chef's Choice 130 knife sharpener is our most popular model. This three stage diamond sharpening station gives you the flexibility to achieve the result you need. Two stages are for sharpening and the third is for stropping (polishing). Equipped with elastomeric guides that hold the angle of your blade at a precise combined 20 degree angle, no oil or lubricants are needed and there is no blade clamping that can cause your blade to overheat. The 130 comes in a variety of colors that will compliment any décor, making this the perfect option to set on your counter and use at a moment’s notice. The three-stage Chef's Choice 120 knife sharpener is our second most popular model. It’s available in a range of colors; the classic black and white choices perennially vie for top spot, but the 120 in red has a big fan base too. Like all Edgecraft diamond sharpeners, these machines quickly put a shaving-sharp edge on your knives, quickly and without risk of heat damage. The Asian 316 sharpening station is the model you need if you have traditional single-bevel Japanese blades, Chinese style cleavers or contemporary double-bevel Asian cutlery. The high precision elastomeric angle at 15 degrees produces a sharp edge every time. The Hybrid 220 combines electric and manual Criss-Cross™ technology. You’ll get a sharp, burr free edge with lots of bite using this tool. Equipped with two sharpening stations, stage one is electric for sharpening while stage two is manual for honing and re-sharpening; it will sharpen straight or serrated blades, kitchen and household cutlery, sport and pocket knives. With its multipurpose functionality and brilliant design, we think you’ll be impressed. The Chef's Choice 1520 knife sharpener lets you to restore and sharpen Asian, European and American knives. It allows you to create a gothic arch structure that’s known for its extraordinarily sharp edge and staying power. Use this station to sharpen Santoku, Japanese style single bevel edges and thick Deba style blades. Extremely versatile, this sharpening station is the one to own if you have a variety of knives. The ScissorPro 500 makes it easy to sharpen your scissors at home. No need to take your shears to a professional, you’re the professional now! They got it right with this unit, it’s perfect for left- or right-handed style scissors and poultry shears too. You don’t even have to take your shears apart to sharpen them. This scissor sharpener is the Editor's Pick of Vogue Patterns magazine! The Edgecraft 464 Pronto knife sharpener is the fastest two stage manual sharpening station on the market. Its Criss-Cross™ technology uses abrasive wheels that sharpen into and out of the knife’s edge, creating a blade with aggressive bite. The first stage profiles and the second stage fine-sharpens. It’s easy to use and store! The handy Kuhn Rikon manual knife sharpener is perfect for both straight and serrated blades. This space saving collapsible model features a grip-tight handle and non-slip feet. The ceramic stones help create a fine edge and will provide you with years of good service. Kuhn Rikon puts quality, innovation and attention to detail into all their products. The Brød & Taylor manual knife sharpener was designed by Austrian master cutlery craftsman Harald Stallegger. Built of solid stainless steel, it performs three sharpening techniques: Coarse shaping, sharpening, and honing/polishing. The sharpening surfaces are ultra-hard, ensuring that the Brød & Taylor sharpener will last for years. Safe for serrated, specialty, and all other types of steel knife blades, it will keep your cutlery razor sharp and its elegant looks will compliment your kitchen. Pleasant Hill Grain provides a superior online shopping experience for home and kitchen products. We’re a factory authorized dealer for all of the knife sharpeners seen above and we also carry a wide selection of appliances and cook’s tools including Victorinox cutlery and Kuhn Rikon cutlery and cook's tools. All of these items are stocked at our location for fast and reliable shipping to you. Have questions? Please call us at the number below—we’d love to help you select a knife sharpener that’s perfect for your needs!